As you may know the Surface Pro 3 + Surface Pro 4 / Surface Book WiFi is terrible. 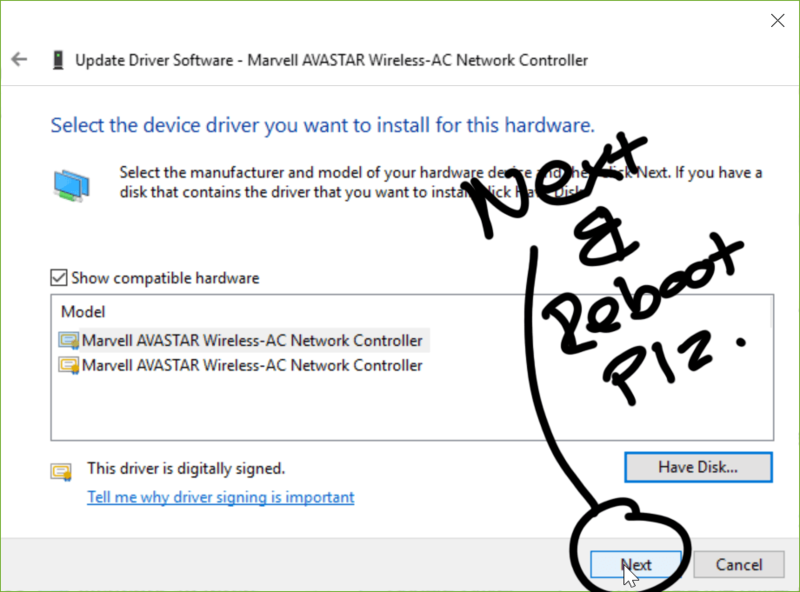 This is caused by a combination of a poor choice in WiFi chipset (a Marvell AVASTAR Wireless-AC Chipset – basically an all in one package with WiFi, Bluetooth and NFC) with driver issues. It is somewhat fixable (and by somewhat, not great but also far better than before). 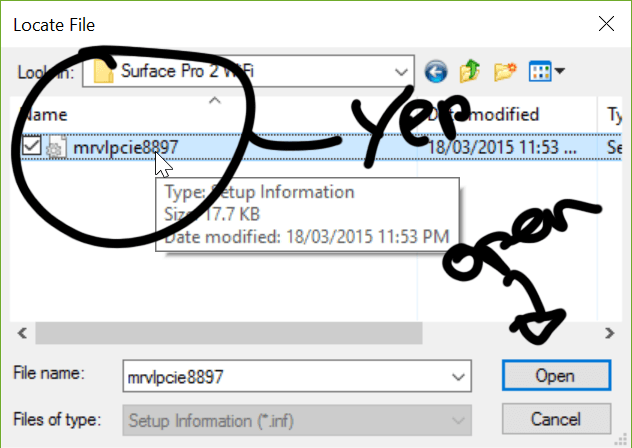 The fix is simple – I’ve tried a few methods like using other driver packages from the Surface Pro 4 / Surface Book and also different driver versions and registry fixes – none of which actually improved things. In the end I found older Windows 8.1 drivers published which worked well. Download the drivers from Here (740kb RAR archive). Extract it somewhere safe – for example on the root directory of the C:\ drive. 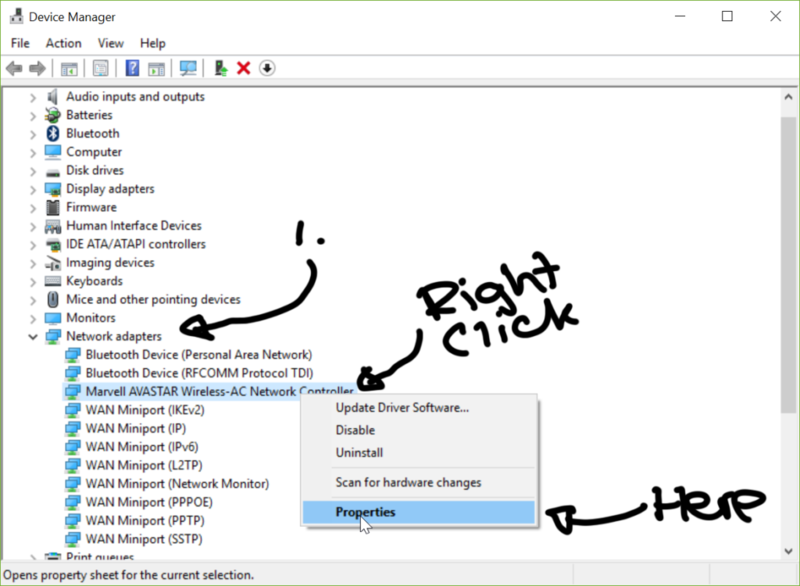 Go into device manager (right-click on the start icon, device manager). 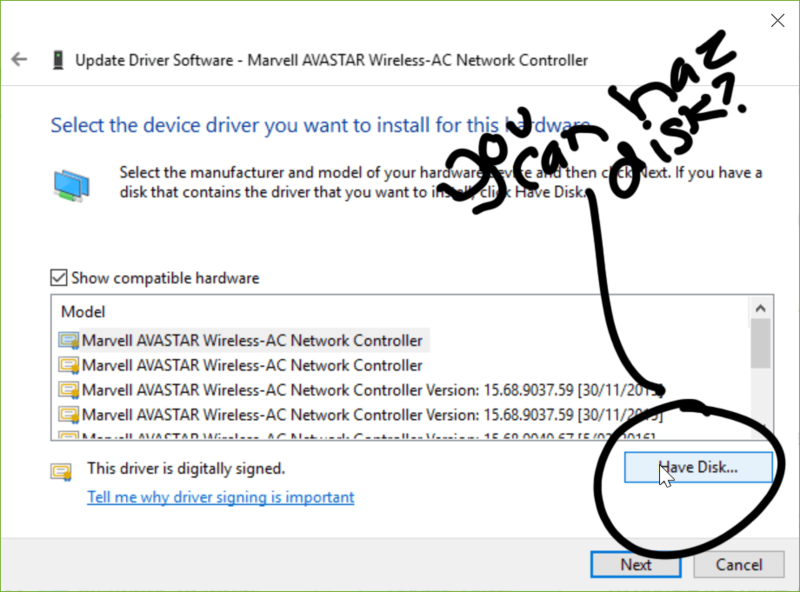 Go to Driver –> Update Driver… But really you’re downgrading the driver. Browse for that sucker. 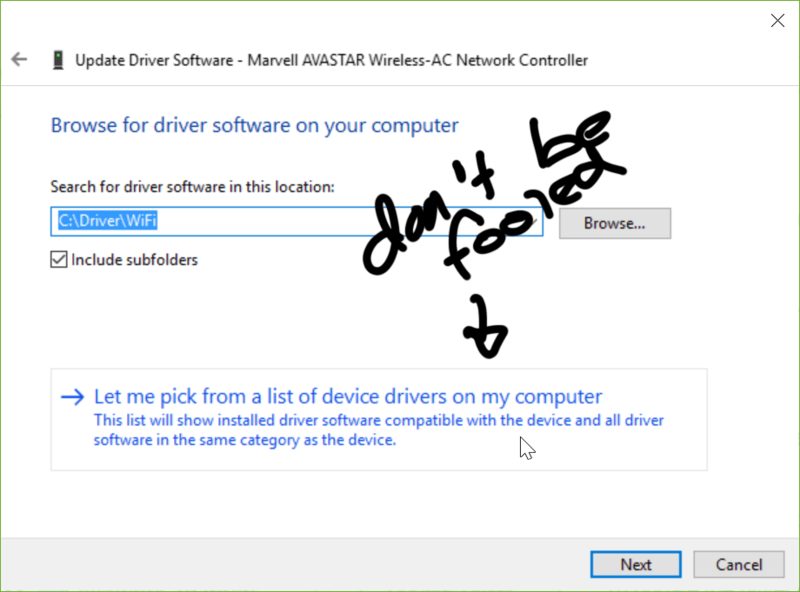 Searching automatically won’t do anything as Microsoft like to stuff things up with their drivers. 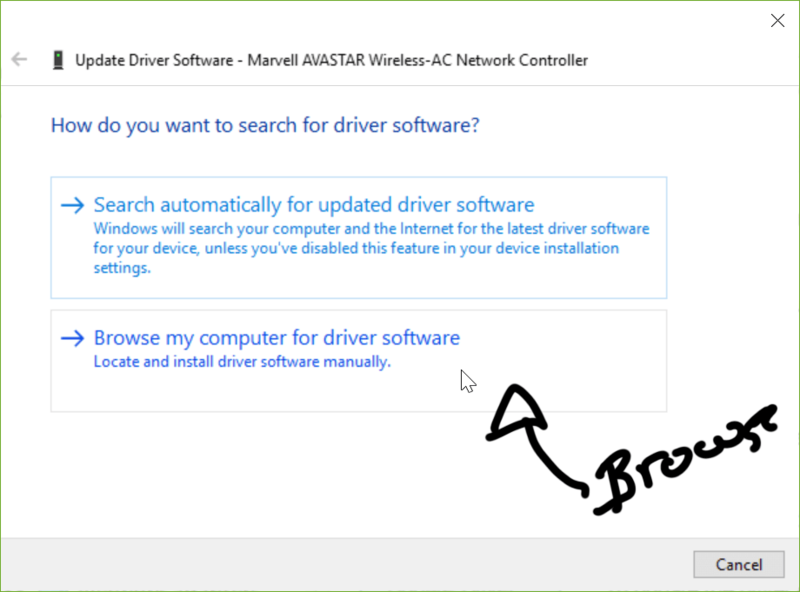 If you’re familiar to Windows you know how useless the “Search for driver” option is here – because the best driver is always installed according to Windows. Lets pick a driver. Right, here you’ll want to grab that floppy drive out because you have the disk – it just isn’t on a floppy (except, the driver is small so it could potentially be if you swing that way and want some nostalgia points). Find that sucker – and open it (yes, you’ll need to unrar that file first and put it somewhere where you can find it). Just select and next your way through it, reboot and you’re done. After downgrading the driver you’ll get acceptable speeds however they’re still not great (especially in the upload department). I really hope Microsoft eventually fix this issue as really its customers shouldn’t have to go through this crap to get their product to actually work kinda as it should. This is just what worked for me and so I wanted to share it without the rest of the firmware package you likely don’t want – whats the point downloading a ~580Mb file just for ~1Mb worth of drivers? Hopefully this helps you. I am more posting this as a quick guide because there is so many posts out there without an actual fix and whilst this isn’t really a fix (it is more of a workaround) it is still better than their latest POS drivers. It just shows a couple of things here: components manufacturers are really bad at keeping drivers updated once something hits the channel (and this is for ANYTHING), and OEM will use anything cheap, even if their product commands premium street price. Just wanted to say thanks for this! I have a Surface Pro 3 running Windows 10 and I’ve been frustrated trying to get better speeds for my Arris modem. This driver resolved my issue, finally! Immediately following the MS Office update installed on 03APR19, my network card became essentially unstable to the point where it was unable to detect WAPs within six feet. Only rebooting after several minutes off-line would restore operation which would only last until a short while. 3 hrs on phone with MS Surface Tech Support plus a 100 mile RT to the MicroSoft Store resulted in the advice to replace the computer because they (the MS Store) could not replace the apparently bad network card. Further research located this article. 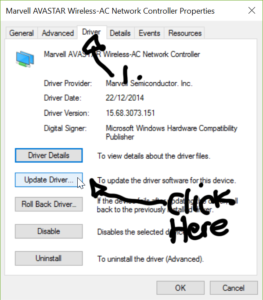 I re-installed the original driver set (mrvlpcie8897(dot)inf; 15.68.3073.151). The Surface came back to life immediately and remains functional following reboots.